Not too long after this hit the web, and couple of parodies popped up. Some blogger colleagues and I started talking, and thought it would be great to see a lot of people working on parodies of this ad, switching out the subtitles. This thing is RIPE for parody, don't ya think? Can we make this the internet's next great video meme? So we're putting the call out there and making this a contest. I know there are a lot of smart and talented folks who can take this video, add your own alternate subtitles, and flip the damn thing inside out. A collective community effort that produces all kinds of funny parodies would be a much more powerful response to this ad than just yelling and hollering about it. 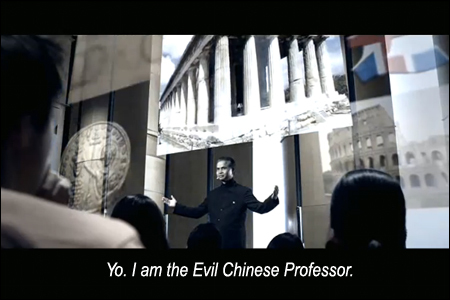 Download the .ZIP archive, including the subtitle-stripped .MOV file and .RTF text file transcript of the original "Chinese Professor" video. Get the video file, write a hilarious alternate monologue for the Evil Chinese Professor, re-subtitle the footage, add a call-to-action voiceover at the end, and upload your parody to a video sharing service like YouTube or Vimeo (Heck, upload wherever you can. CAGW is apparently cracking down on all parodies). Then send the link to evilchineseprofessor@angryasianman.com. The best three videos as judged by the sponsoring bloggers will win some fabulous as-yet-undetermined prizes. 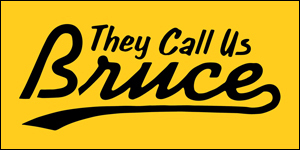 The deadline to submit is November 27, which happens to be Bruce Lee's birthday. Get to work! And be creative. The Evil Chinese Professor awaits. This contest is co-sponsored by 8 Asians, Disgrasian and Reappropriate. Also in on the action: ChannelAPA and Hyphen.